Bacterial glucansucrase with a short glucan chain (red). We brush our teeth twice a day with fluoride toothpaste, use mouthwash, limit sugars in our diet...and we still get cavities. Cavities are caused by bacteria that consume some of the sugar in our diet, ferment it, and then release acids. These acids eat away at the hard minerals in our teeth. It seems like it would be easy to brush these bacteria away, and get rid of them once and for all. However, they have a trick to avoid this. 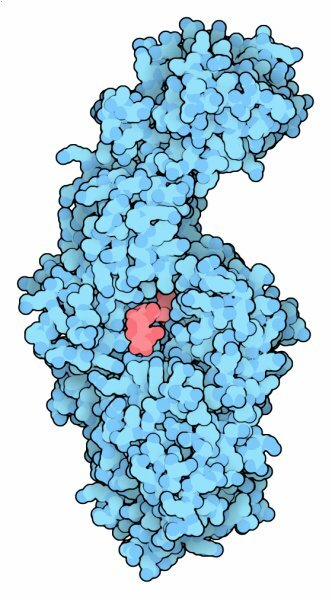 These bacteria use the enzyme glucansucrase, shown here from PDB entry 3aic , to build long, sticky chains of sugars called glucans, using the sugar in our diet. These glucans glue the bacteria to the surfaces of our teeth, forming a biofilm that is difficult to remove. Researchers are currently using the structures of this enzyme to design inhibitors that will block its action, and thus remove this form of protection for the bacteria and ultimately protect us from tooth decay. Glucansucrases perform two reactions. First, the enzyme takes sucrose and breaks it in half, forming glucose and fructose. The fructose is released, and the glucose is then added to the growing glucan chain. Glucansucrases are large proteins with many domains. These reactions are performed in the central portion of the enzyme, which is included in this structure. The enzyme also includes additional domains that anchor the enzyme to existing glucan chains. 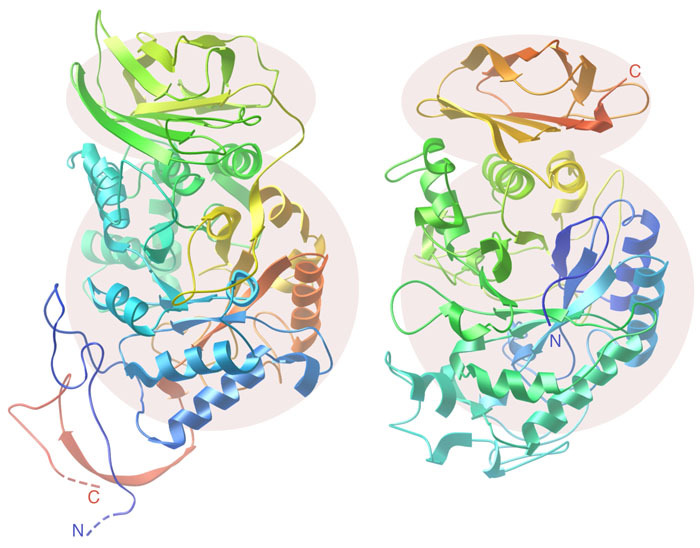 Chain fold and domain structure of glucansucrase (left) and alpha-amylase (right). When the amino acid sequences of glucansucrases were compared with other sugar-cutting enzymes, it was found that they are similar to alpha-amylase, but with a difference. The sequence is permuted, so that portions at the beginning of the glucansucrase chain are found in the middle of the amylase chain. When the structure was solved, this relationship was confirmed: the structures have a very similar folding of the chain, but the sequences are permuted. You can see this by comparing PDB entries 3aie and 1smd . In the figure, the chains are colored from red at one end to blue at the other end. You can also look at the Molecule of the Month on circular permutation to see other examples. Structures have been solved for glucansucrase from two different bacteria: Streptococcus mutans, shown in the previous sections, and Lactobacillus reuteri, shown in the Jmol. The Lactobacillus enzyme has been studied in several ways. First, a mutant form was used to reveal the structure of the complex with sucrose; the mutation hobbles the enzyme so that it can't perform the cleavage reaction (PDB entry 3hz3 ). Also, a complex with maltose was solved to get a view of how larger sugar chains may bind (PDB entry 3kll ). 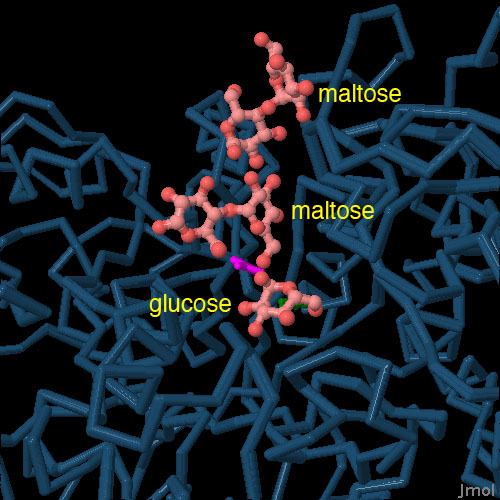 The image here combines both structures to simulate how the enzyme might look in the middle of the reaction, when fructose is cleaved away, leaving a glucose ready to add to the glucan chain. Click on the image to see the two structures and this simulated complex. When you look at the complexes of glucansucrases with sugars, you will find that there are several sites outside of the active site where additional sugar molecules bind. Do you think that these may play a role in the function of the protein, or are they just artifacts of the experiment? You can use the "Compare Structures" tool to explore the circular permutation of glucansucrases and alpha-amylase. K. Ito, S. Ito, T. Shimamura, S. Weyand, Y. Kawarasaki, T. Misaka, K. Abe, T. Kobayashi, A. D. Cameron and S. Iwata (2011) Crystal structure of glucansucrase from the dental caries pathogen Streptococcus mutans. Journal of Molecular Biology 408, 177-186. A. Vujicic-Zagar, T. Pijning, S. Kralj, C. A. Lopez, W. Eeuwema, L. Dijkhuizen and B. W. Dijkstra (2010) Crystal structure of a 117 kDa glucansucrase fragment provides insight into evolution and product specificity of GH70 enzymes. Proceedings of the National Academy of Sciences USA 107, 21406-21411. J. D. B. Featherstone (2008) Dental caries: a dynamic disease process. Australian Dental Journal 53, 286-291.